Ant Control Miami - 786-462-5912 - New Era Pest Control Inc.
Is this an ant or a termite? 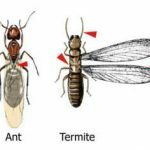 A very easy way to tell the difference between a carpenter ant and termite is the ant will have the typical pinched waist line, where the termite will have a more one piece body. The antennae of the carpenter ant will be elbowed rather that straight. The wings of the termite are almost twice the length of the body and are uniform in size. Where the wings of the ant are more proportionate to their body size and the second set of wings are shorter. 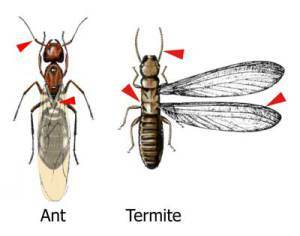 Determining whether you have flying ants or winged termites is important in how the problem is treated. Our experiences with carpenter ant Control is one that requires the use of a good detective. Our technicians are trained with those skills in mind. Finding the nests is critical to success and sometimes is rather difficult one to remedy, unless a complete set of variables are considered. The typical call comes in and we are told that ants are swarming around a light source, let’s say in the bathroom, in a frenzy around the bathroom light. A number of dead ants are found the next day in the same vicinity. When this call comes in, in the summer we assume it’s an ant issue, and normally are correct. The most important factor in controlling Carpenter Ants is inspection. Determining if the nest is located outside and foraging inside, or if a colony or satellite colony exists inside the home. Is many cases we will find that ants are searching for food and water inside the home. Their main colony may exist outside, however the short journey into your home may provide adequate food and water sources to sustain the colony. In our findings, most of the time, we find that carpenter ants love moist, shady areas. Very rarely will you find a colony out in the sunlight. So lets say you are having an ant problem on the west side of the house. My vision of that side of the house may look something like this or close by (Maybe a neighbors home?) 1. Shady 2. Moist 3. The presence of wet, possibly rotted wood, ex. wood chips, rotting trees touching the structure, rotted wooden fence, old wood stacked on the side of the house, or something similar. These are the areas to begin your search for colonies. The key to this search is you have to search just before sunset. This is when they start their foraging. If you do find roaming ants, DO NOT KILL THEM just yet! Use them to locate where they are going and where they are coming from. Once the nest is located then treatment measures can begin. Many times the ant colony is located outside and foraging into your home. However, this is not always the case. I have seen where a roof had a water leak and the wood became rotted. Remember carpenter ants like wet, rotted or decaying wood to rear their young. It is possible that the ants may have trickled up a tree touching the structure and started a satellite colony in that area. I have seen many times a nest started in the typical window frame or door frame. I have also seen where water damage has gathered in the corners of a room under the wooden floor or under the carpet tack stripping and moisture just helped out the situation. If those areas are not the culprit, searching wall voids around electrical outlets, cable or phone outlets are a great place to dust to see if you can stir up a colony. Another great place is the attic. Simply dusting the attic may resolve the issue, or a combination of all may be required. There are a number of ways to treat carpenter ants. The situation really dictates what treatment method is used. In the attic and wall treatment, using a diatomaceous earth based product with natural pyrethrin would work well. However, spreading a light coat consistently in the attic is clearly the way to go. Clumping the ingredients in certain areas simply, will not work. Wall voids must be treated correctly or killing workers occurs. Using a series of ant baits can be effective if using the appropriate ant bait and in the right doses, in the right areas. Remember these ants go through a sugar feeding phase, and a protein feeding phase. Knowing the difference will make all the difference in the world.